Our 34th president learned well from the many errors he made as commander in chief of America’s army in Africa and Europe, and then as Allied Supreme Commander, during World War II. 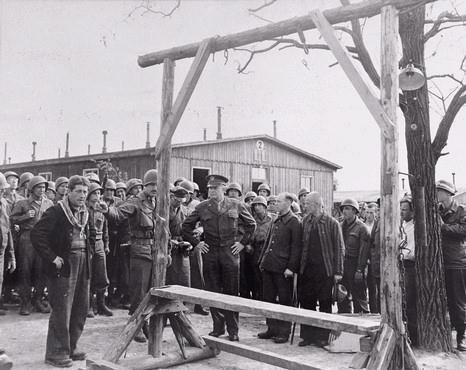 “I visited every nook and cranny of the camp because I felt it my duty to be in a position from then on to testify at first hand about these things in case there ever grew up at home the belief or assumption that the stories of Nazi brutality were just propaganda. Some members of the visiting party were unable to go through with the ordeal. Eisenhower, not Kennedy or Johnson, was the first president to take a principled stand for Civil Rights. He followed through against the Southern Democrats whose century of delay and obstruction had frustrated realization of those rights for black Americans. Governor Orval Faubus of Arkansas refused to comply with Brown vs. Board of Education. In 1957 he sent out the state’s National Guard to prevent nine black kids from attending Little Rock Central High School. Rioting broke out and Faubus did nothing to stop it. 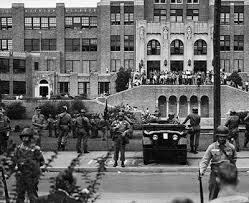 So Ike sent in 1,000 paratroopers from the 101st Airborne, one of the units he had commanded on D-Day, to restore order and ensure that the” Little Rock Nine” could attend the public school. That move established the principle of deterrence, a no-first-strike rule that has held to the present day. He never tipped his hand to the Russian Communists and other evil empire-builders of his era, however. He avoided involving America in what he called “brushfire wars” while making enemies believe that he would have no compunction about engaging in another world conflict. When he came into office, he inherited a $6.5 billion deficit. Tax cuts, reductions in government expenditures, and abolition of price controls launched an economic rise that brought on surpluses by 1956. He left office with a surplus, and with the interstate highway system well underway and financed by a dedicated gasoline tax. Eisenhower died in 1969. He was buried in an $80 Army coffin and wearing his standard field jacket. The only ornamentation consisted of his five stars, recognizing his rank as General of the Army. John J. Pershing also had that rank, as did George Washington, although Washington’s fifth star was awarded after his death. Eisenhower’s predecessor “Give ‘em Hell Harry” once remarked with cynical realism that a statesman is a politician who has been dead for 10 or 15 years. It has taken much longer than that for history to show how great a statesman Dwight Eisenhower actually was. 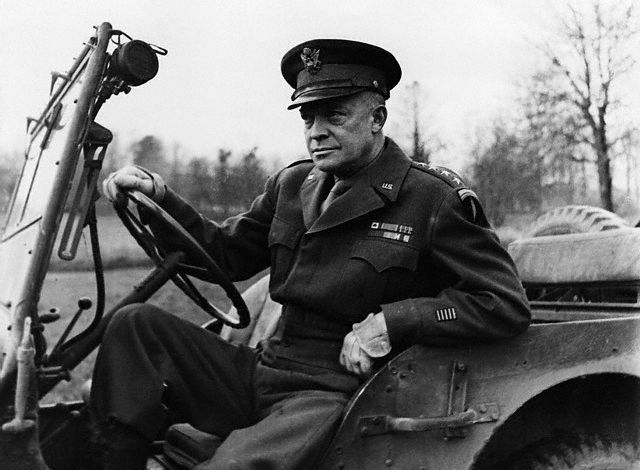 Ike was so much more than a bland old retired soldier who liked to play golf. He was the perfect man for his time as leader of our nation, and, more importantly, he was one of the best presidents ever. Though I was born in the Truman Administration, Dwight Eisenhower was the first president I knew. I was one of the many Boston kids who joined Big Brother Bob Emery in a toast to the president each day, raising our glasses of milk while “Hail to the Chief” played. I like Ike even more now than I did at the time, and nowadays I raise a glass of adult beverage in salute to him. 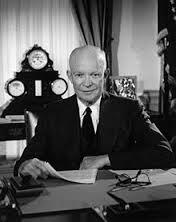 America sorely needs another president with Dwight Eisenhower’s character, values, experience, and perspective. You are currently browsing the Veteranscribe's Blog blog archives for September, 2013.